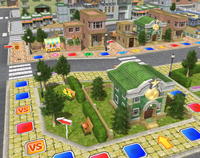 Koopa's Tycoon Town is a board in Mario Party 8. Koopa Troopas and Goombas are seen sitting comfortably while cars and other vehicles drive by on the city streets. To obtain Stars on this board, players must invest coins in hotels. 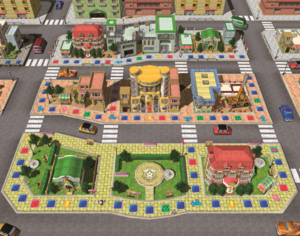 This is similar to both Koopa's Seaside Soiree from Mario Party 4 and Windmillville from Mario Party 7, except that with more coins invested in a hotel, the more beneficial it is to the player or team. After a hotel has over 20 coins invested, it becomes a 2-Star hotel, and after accumulating 50 coins total, it becomes a 3-Star hotel, the final hotel stage. However, only the player who has invested the most coins owns the hotel and its Stars. It is impossible for two or more players or teams to invest the same number of coins in any one hotel. There is a fixed and limited number of attainable stars on this board. Because when all hotels are under ownership, the minimum number of Stars in play is 11; while the maximum is 21 (if counting the 3 Star Hotels on the Lucky Space areas). On Star Battle Arena, however, because there are three normal hotels, the minimum number of Stars in play is 3; while the maximum is 9. Hotels can be fully owned (and hence investments blocked) by a total investment of 100 coins from one player into the hotels. Luigi landing on one of the two Lucky Spaces (Japanese version). Landing on a DK Space makes Donkey Kong arrive in his own cab, and invest twenty or thirty coins in one of the hotels on the player's behalf. When someone lands on a Bowser Space, Bowser comes and takes 10 coins from everyone's investments from a random hotel.
? Spaces at the front of the board makes a Koopa Troopa in a cab appear and takes players to a space in front of one of the hotels. ? Spaces in front of alleys may cause Bandit to appear (occasionally, nothing happens, especially if a Bandit steal just happened or there are only one-coin or no investments in any hotel) and steal opponents' coins from a random hotel, then gives them to the player. The amount stolen is either 30 coins or the amount of coins such that the opponent's investment is one coin above the next highest investment in the hotel, whichever is less. The ? Space in front of a shop with a dart board at the back allows the player to throw a dart on the dart wheel. Players who land on their face win 10 coins. How much is determined by how many times the minigame has been played, as failure causes the grand prize (starting at 10 coins) to go up by 10 coins. There are also two ? Spaces (coming from each direction) next to a construction site. Players landing on one of these can get the crane to rain 10 coins down on them (20 in Star Battle Arena). This board has two Lucky Spaces. Landing on one of the two Lucky Spaces allows the character to be taken to one of two secret three-star hotels where they only need one coin to initially buy it. The hotel on the top-left of the board is reached by landing on the Lucky Space on the leftmost aisle next to the middle road, and the one on the bottom-right is reached by landing on the Lucky Space between the two hotels on the top row. Bowser, Donkey Kong and Bandit are unable to affect these secret hotels through landing on their spaces, making the secret hotels a safe place to invest one's coins and also guaranteeing Stars by fully owning the hotels with 100-coin investments. In Star Battle Arena, the winning conditions are to get four stars by investing coins in hotels. The following tables show how many spaces there are on the board, and how many there are of a certain type. Coin amounts with a blue banner mean that character is the current owner. Coin amounts with a green banner mean that character is a visitor to that hotel. Coin amounts with a red banner mean that character is an enemy and it subtracts coins. DK pulls up in his yellow convertible. Luigi buying a Three Star Hotel. This is the only board that has more than one Lucky Space. Koopa's Tycoon Town is the second board in the series with a fixed and limited number of attainable Stars (21), after Windmillville (11 stars). There is an error in which whenever somebody becomes the owner of a hotel on this board, the Koopa standing at the hotel will sound like a Goomba. Although the Lucky Space is absent in Duel Battle, the Lucky Space areas can still be seen in the background of the board. This page was last edited on December 7, 2018, at 16:25.